When the film, as it must, comes to an end after two and a half hours, you won't be ready; the bond made to this family makes its sudden absence feel downright brutal. 151 min. IFC Films. Director: Abdellatif Kechiche. Cast: Bruno Lochet, Sabrina Ouazani, Olivier Loustau, Alice Houri, Sami Zitouni. Movies about food and family have become a genre unto themselves and, in many cases, sadly clichéd. But there's a freshness to Abdellatif Kechiche's The Secret of the Grain (a.k.a. La graine et la mulet), the deserving winner of four César awards. Kechiche (L’Esquive) brings an earnestness and rigor and cultural authenticity to his intergenerational drama, but more importantly, he captures the emotional rhythms of an extended family at its best (love and support) and worst (pettiness and neglect). Much has been written about the film's lousy title, though the original French title is slightly better in name-checking both couscous (la graine) and fish (la mulet). These are the two delicacies—specialties of the house—that send the French-Arab family into ecstasy and encourage recently downsized sixty-one-year-old Slimane Beiji (Habib Boufares) to open a portside restaurant on a junked ship. Perhaps a better title would have been "It's Complicated," as the family dynamics surrounding patriarch Slimane are tricky indeed. His girlfriend Latifa (Hatika Karaoui) houses him in the rundown hotel she manages; there, he's a surrogate father to Latifa's twenty-year-old daughter Rym (Hafsia Herzi). But Slimane also serves the needs of the extended family branching from his ex-wife Souad (Bouraouïa Marzouk) and their children Karima (Faridah Benkhetache), Majid (Sami Zitouni), Olfa (Sabrina Ouazani), and Riadh (Mohamed Benabdeslem). The kids tease their mother that Slimane's fish-delivering visits and her cooking of couscous and fish for him signify an undying love. "It's stronger than love," she answers. "It's habit." Since Slimane's hopeful project of leaving the restaurant as a legacy for his children hinges largely on the celebrated cooking of Souad, Latifa is hurt and wary the closer Slimane gets to achieving the dream (it doesn't help her ego that she's a bad cook). Rym, on the other hand, gives unconditional support to Slimane, serving as his translator and business associate as they navigate the terrible bureaucratic hurdles endemic to opening a restaurant (Rym also acknowledges the greatness of the food, saying, "When there's couscous like this, the world disappears"). More family drama comes from the worst-kept-secret of Majid's philandering (despite having a newborn), which makes an emotional mess of his Russian wife Julia (Alice Houri). The issues converge in the extended climax that is the film's third act: a test evening for the restaurant that has the city's movers and shakers—the ones who can make or break the restaurant—impatiently awaiting the couscous and fish they've heard so much about. Though the story lightly touches on issues of Arab integration in the notion of struggling to get approval to take an open spot on the coveted quai de la République (the waterfront of the Republic), the film's engaging textures mostly come back to food and family. Despite many of the actors being non-professionals, the characters are thoroughly believable. Houri has an amazing tear-laced rant about Majid, and Herzi astonishes with a heroic belly-dance, but it's not only the pyrotechnics that impress: playing a role intended for Kechiche's real-life father (who passed away before production), Boufares makes Slimane's quiet determination resonate, especially as it grows quietly fretful. The soul of the picture is the father's sacrifice for his family, and when the film, as it must, comes to an end after two and a half hours, you won't be ready; the bond made to this family makes its sudden absence feel downright brutal. 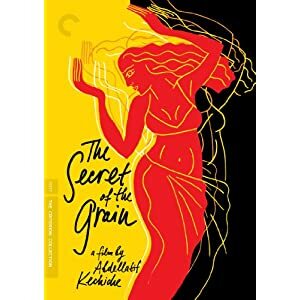 The Secret of the Grain makes its home-video debut in twinned Blu-ray and DVD special editions from Criterion. This is the sort of film that usually looks dull as dishwater on home video, but the HD source looks especially terrific on Blu-ray, which boosts detail and color vibrancy from the likewise impressive DVD. Contrast is spot-on and the image is sharp (even pleasing during the nighttime scenes, which betray only a hint of noise), but it's the eye-catching color that perhaps most distinguishes the image. The DTS-HD Master Audio 5.1 soundtrack is excellent, with its clear dialogue, subtle detail and ambient immersion, and potent music, key to the climactic restaurant sequence. As usual, Criterion further distinguihses itself from the competition with its suite of bonus features. "Abdellatif Kechiche" (12:46, HD) is Criterion's exclusive interview with the film's director, who discusses his filmmaking philosophy and approach to story, his father as a source of inspiration, working with actors, and more. "Sueur" ("Sweat") (45:10, HD) is "Kechiche's reedit of Rym's belly-dancing sequence...a new visual and aural interpretation of the film's passionate climax." There's also a "Kechiche Introduction" (1:40, HD) to the featurette. Next up is an excerpt from the French TV show "20 Heures" (7:51, HD) with Kechiche and Hafsia Herzi chatted up in studio and Sète locals/actors Nadia Taouil, Leila D'Issernio, Jeanne Corporon, and production assistant Kader Boulaga interviewed in a remote segment. "Ludovic Cortade" (21:04, HD) finds the French film scholar taking a nicely sociological approach in addressing the themes and style of the film. "Hafsia Herzi" (14:41, HD), the actress who plays Rym, discusses being cast and how she tried to fulfill the faith Kechiche put in her; she also discusses her weight gain for the role and the memorable dance sequence. "Bouraouïa Marzouk" (11:02, HD), the actress who plays Souad, discusses her life, career and work on the film. "Musicians" (15:17, HD) is a fun, loose chat with lute player Abdelhamid "Hamid" Aktouche, flutist Idwar Iskandar, zither player Salah Eldin Mohamed, and violinist Ezzedine Bouzid, who all feature in the film's restaurant sequence. Last up, you get the film's "Theatrical Trailer" (2:17, HD) and a 12-page booklet with photos, film credits, disc credits, and an essay by film critic Wesley Morris. All site content © 2000-2019 Peter Canavese. Page generated at 04/24/2019 07:00:23AM.